It was a great relief to get my first garment project of 2019 off the needles while there’s still a little bit of a chill in the air. 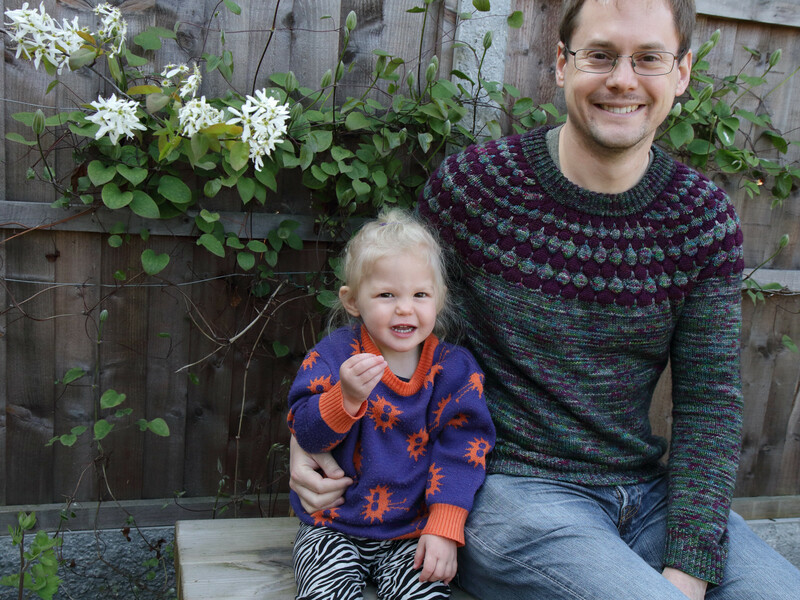 It was 2015 when I last made a sweater for my partner (Grettir by Jared Flood ), so he was due a new one. 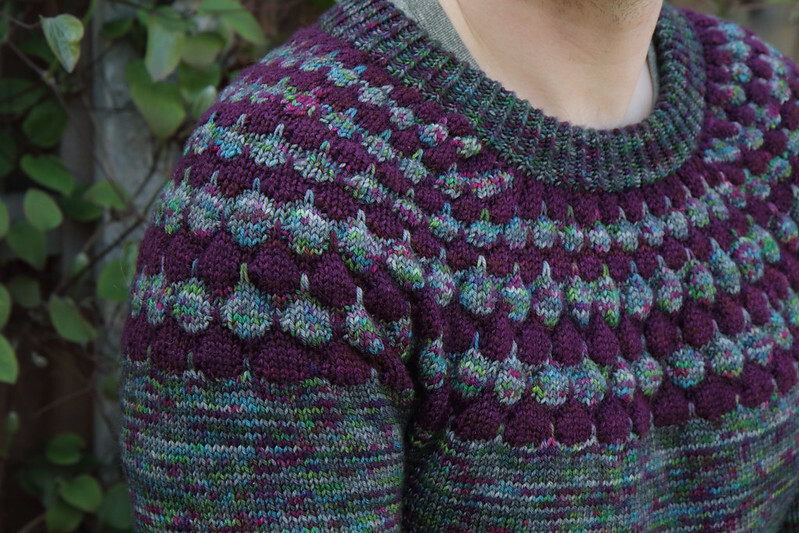 I presented a few options but I was very happy when he was as excited as I was about The Bubble Sweater pattern by Stephen West. He also chose the yarn, which is our Dynamite DK in ‘Space Race‘ (main colour) and ‘Dancing in the Dark‘ (purple). The instawebs seemed to love this combo and we sold out of ‘Space Race’ immediately after posting the WIP, then sold out of the next batch too and last week I got a third, jumbo batch done which I hope will keep everyone going! This design is worked top down and is all about the fun yoke, and the bubble stitch is surprisingly easy. 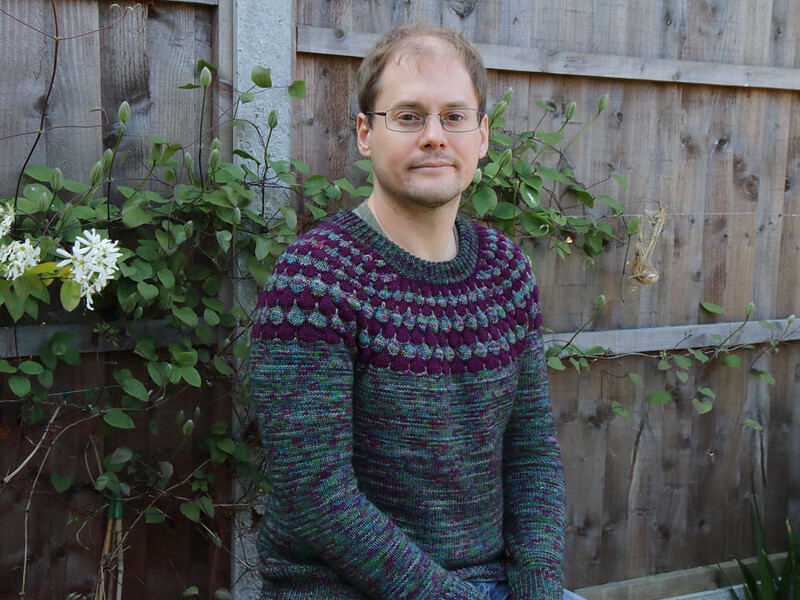 The pattern also features a folded neck band (my favourite kind) in twisted rib. The curious thing about the top section is that it’s the same for all sizes, which does lead to the small sizes having a proportionally wider neck that the larger ones. I’m not sure how well this would work on my narrow shoulders, but it works pretty well on my partner (this is the size ‘M’ which is the same as the sample worn by Mr West himself), and several women friends with wider shoulders than me tried it on as a WIP and it looked great on them. I had to re-knit the sleeves multiple times because they came up very tight, working probably only half as many decreases as specified. I’m not sure whether this due to it being a unisex fit rather than specifically men’s sizing, but it’s something to watch out for. All in all, it’s a very simple knit and fun to wear. I am still pondering one for myself with a bright contrast colour, but I think I would need short row shaping and a little hacking of the yoke sizing.